Fine Art Paintings of "God's Best Work"
Master Artist R. W. Hedge's original oil paintings can be found in some of the finest art collections and galleries nationwide. 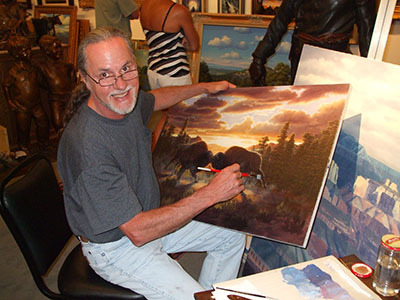 Ronnie derives his inspiration from the amazing natural wonders of the American countryside and wildlife that he refers to as "God's best Work". He has developed his own unique style that conveys his passion in the unrivaled accuracy and detail of his work, combined with his use of color makes his painting come appear to come alive. "I paint things the way they look when I'm actually there", says Mr. Hedge. "If I can see it, it's in the painting." Now these exciting and beautiful works of art are being offered as Archival Museum Quality Eagle Giclees produced in limited edition on canvas with Certificates of Authenticity with artists signature. These giclees are the only offerings authorized by Ronnie before he passed away. Decriptions of each painting were written by Ronnie.